Ebisu is a neighborhood in Shibuya, conveniently near Roppongi and it home to many trendy boutiques, vintage stores and patisseries all within easy walking distance from Ebisu station. Ebisu Station恵比寿駅・えびすえき (恵比寿 – blessed by comparative longevity) was first opened to passenger service in 1906. Before that time it was a 貨物ターミナルかもつたーみなる・freight terminal for the neighboring Yebisu Beer Brewery恵比寿ビール記念館・えびすびーるきねんかん. Today the area on the 東側ひがしがわ・east side of the station, where the brewery once stood, has been redeveloped into the Ebisu Garden Place恵比寿ガーデンプレイス・えびすがーでんぷれいす, one of the most pleasant places in Tokyo. This “city within the city” is home to a wide array of shops and restaurants, a デパートdepartment store, a シネマcinema and a park-like square with trees and fountains噴水・ふんすい between the buildings. The main 40-story tall Ebisu Garden Place Tower is itself a small city, housing a 郵便局ゆうびんきょく・post office, bank銀行・ぎんこう, health and dental clinics and more, but it’s party piece is the restaurants on the 38th and 39th floors which offer amazing views of Tokyo. 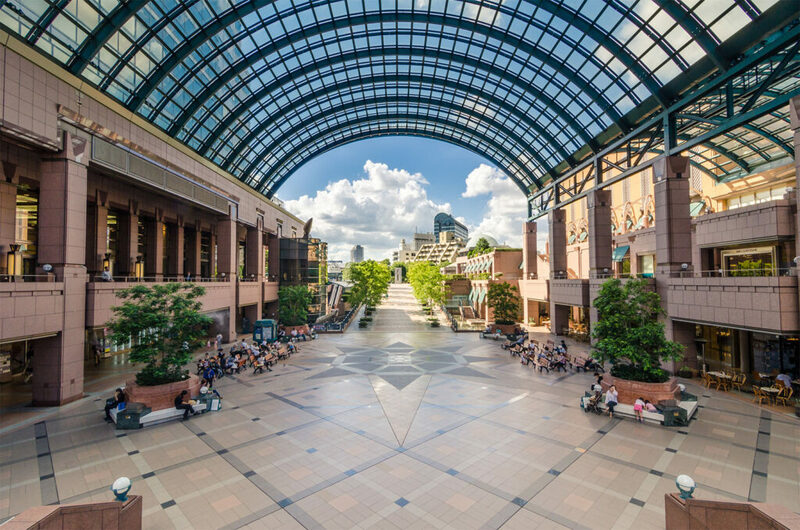 The Ebisu Garden Place is connected to 恵比寿駅えびすえき・Ebisu Station by way of the Yebisu Skywalk恵比寿スカイウォーク・えびすすかいうぉーく, a covered moving sidewalk, so no worries about contending with the traffic. The old Yebisu Beer brewery might be gone but the ビールbeer is not. Standing within the grounds of the Garden Place is the Yebisu Beer Museum恵比寿ビール記念館・えびすびーるきねんかん. The history of Yebisu Beer, including old labels and commercials, the history of Sapporo Breweriesサッポロビール (Yebisu’s parent company) and the brewing equipment from then and now, are all on display here. And of course there is a beer tasting lounge where one can sample 4 different kinds of beer. Also within the Garden Place is the Tokyo Metropolitan Museum of Photography東京都写真美術館・とうきょうとしゃしんびじゅつかん. The 2nd floor gallery plays host to many exhibitions by photographers from all over Japan and the world. The museum is also home to the Images and Technology Gallery, an exhibition devoted entirely to アニメーションanimation and cinematography映画撮影術・えいがさつえいじゅつ. Holography and photo editing suites are also available for hire so if you want to try your hand at photography and edit your own work, you can. Ebisu Station is also the venue for the Ebisu Ekimae Summer Festival, held at the end of ７月しちがつ・July every year, check at the station for the dates. With tons of street vendors屋台・やたい selling traditional Japanese foods and goods, live music, and lots of festival games, the Ebisu Ekimae Summer Festival is both a great time and an excellent way to get a bit of culture.